I am glad to hear that you had a good Christmas in Cape Town. I am even more excited about the prospect to see you and our old friend, David Graaff next month. I wish I could join the two of you on a long boat trip. In Ava’s last letter she wrote how you read through all the letters I have written her and the kids last year. This is good because it gives you a better sense of what has been happening here. At least more information than the weekly telegram. The project we have undertaken has turned out to be quite a venture. I am excited to learn about the premises you are looking at in Kraaifontein (1). Without knowing it, the Harris’s from C & T Harris (Calne) Ltd have probably created the modern methods of producing bacon. (mfo. histories. harris) Andreas knows the Harris family well. He is one of the people who brought the Harris-technology and their Wiltshire cure to Denmark. One of the reasons for creating the bacon empire was that the import of live pigs from Denmark to England was stopped. The ingenious Danish farmers responded to this by organising themselves into cooperatives and the cooperatives build bacon factories all over the country. 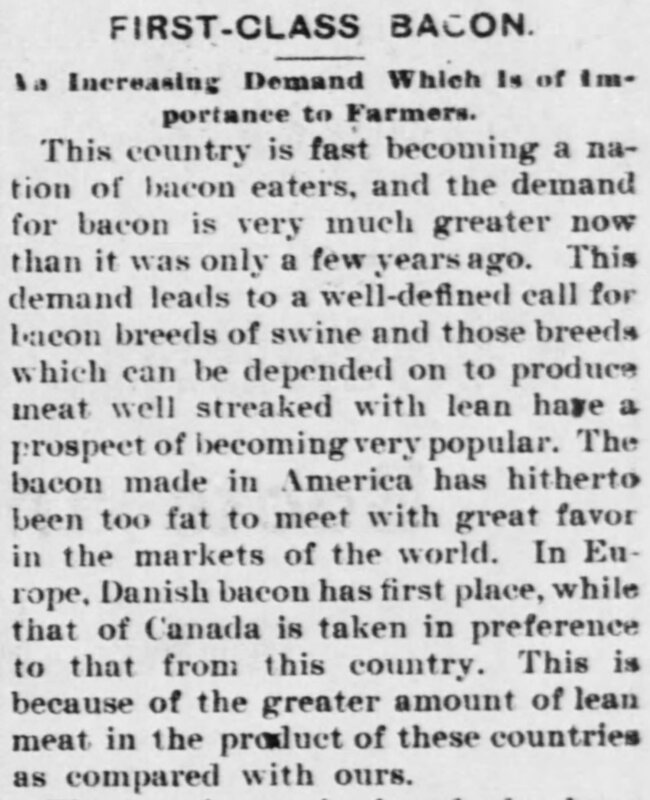 (Daily Telegraph, 2 February 1901: Page 6: Bacon curing) I have not been able to find out who was behind this initiative and would very much like to know more about it. Men and woman of vision should be emulated and I am eager to know more about the people who initiated this. These figures can give us confidence that we are on the right track with our bacon curing venture. 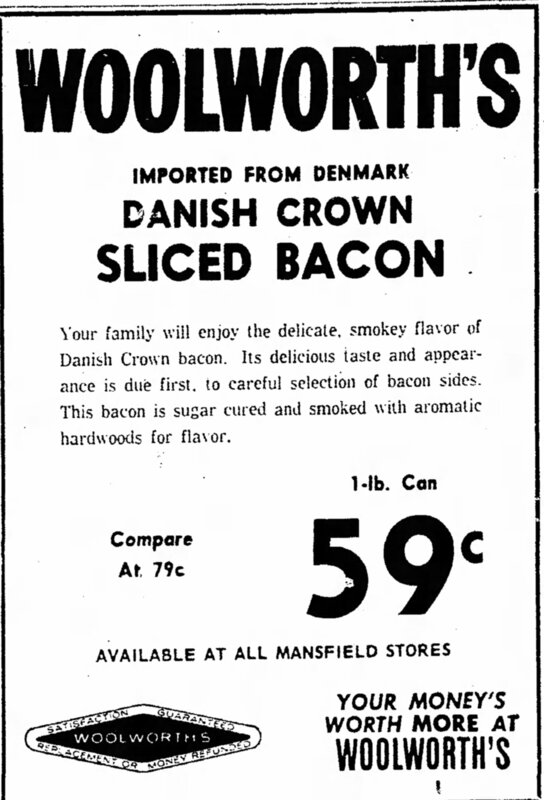 David Graaff is coming to Denmark to source bacon, but I think we can convince him to rather buy the bacon from us and not only sell our bacon to passing ships and to customers on the Rand, but to export our South African bacon to Great Britain. During your trip, this is a subject that will be a good discussion point. The most important department is the machinery for refrigeration. Cold helps to reduce the temperature from the carcass faster after slaughter, thus preventing the formation of Pale, Soft Exudative (PSE) meat which is a big problem for the pork industry since it affects the quality of the meat and makes it difficult, if not impossible to cure it. Refrigeration enables us to store meat from animals we slaughter in the winter and cure it in the summer when the demand for meat is generally much higher than in winter. It makes it possible to buy meat from Argentina or Australia, ship it to South Africa and cure the bacon in our state-of-the-art bacon plant. These we will procure from Combrinck & Co. It is refrigeration that allows us the use of a milder cure since much of the initial preserving function is accomplished through cold temperature which allows for the brine to permeate every part of the side of bacon before it spoils. (Daily Telegraph, 26 April 1910: Page 10: Bacon curing) The salt and saltpeter creates an internal barrier against bacteria while smoking create an external shield, thus taking over from refrigeration. If we so desire, we can freeze the bacon and ship it to Great Britain where it can be sold without any fear that it will somehow purify if an inferior saltpeter has inadvertently been used. The pickle pump is gaining wide popularity in bacon curing, but I will devote an entire discussion on this at a later stage. Refrigeration changed the face and taste of bacon. There are a few things to remember when dealing with refrigerated meat in bacon production. I have been wondering if this is the case and what are the factors in using frozen meat and making freezing part of the curing plant that we must keep in mind. There are quite a number facts related to refrigeration that has become so commonplace that I will not be looking at it here. The optimal time meat can be stored in a frozen state for example. (7) The effect of cold on different pathogens must be thoroughly looked at, but I want to write to you at length about the matter of controlling and eradicating meat spoiling bacteria. Like the matter of pickling, I will do this at a later stage. The few aspects that I think will be “news worthy” are the following. People want to buy their bacon ready sliced. When producing pre-sliced bacon with a high speed slicer, slicing temperature is of the greatest importance. If the temperature of the bacon is too low, the blade of the slicer will be subject to excessive wear and the bacon will shatter. If the temperature is too high, the soft bacon sticks to the blade and the fat is torn away from the lean. The slicing manager must develop practical experience and be constantly aware of the temperature of the bacon and the resultant slice quality. He or she will get to know the different slicers and the different bacon cuts (back, belly, leg, neck, shoulder) and will have to adjust the temperature and blade speed in order to achieve the best slicing results. It is important to have the right stiffness in the meat when sliced with a high speed slicer (800 – 1400 slices per minute). This is achieved by presenting the bacon log to the slicer in a semi-frozen or frozen state. If the temperature is not optimal, meat texture is damaged in slicing which leads to a loss in slicing yield. (James, S. J, et al; 2002: 149) Single stage tempering is when the bacon joints are put on a trolley, wheeled into a freezer that is set at slicing temperature and it remains there until the bacon has reached slicing temperature, evenly throughout the meat. The other large drawback is of course that of space. Large refrigeration rooms will be required to perform this step over a long time period. Generally, the longer the total processing time, the more the weight loss will be. In the end, the correct slicing temperature is probably more important than the small weight loss brought about by a longer processing time. What is of the utmost importance to the quality of the bacon cuts are at the correct slicing temperature. (Brown, T, et al, 2003: 690 – 697) If the total two stage processing time is extended beyond the 8 hour target in order to obtain the correct slicing temperature, this is better than not achieving the required temperature in the meat. “Optimising a two-stage tempering system using a purely empirical technique would be a costly, labour intensive process. Reliable predictive techniques would substantially improve the process.” (Brown, T, et al, 2003: 690 – 697) Such a process must be developed in each factory. At slow freezing the extracellular water freezes first. As freezing continues, the ice crystals grow. This can result in salt crystallization and even pH changes. As far as Edward Smiths assertion that fresh meat is better in some respects than previously frozen meat, this is true on a technical level as far as water holding capacity, pH and such matters are concerned, but not as far as tenderness, flavour and colour are concerned. Freezing will be one of our biggest challenges in our new factory and much time will have to be spend on designing an optimal system. My guess is that you and David Graaff will have much to discuss on your voyage from Cape Town to London on one of Curries steam ships and on your onward journey to Copenhagen. I also know that you and David both enjoy hiking and I am planning a hiking excursion across one of the islands in Denmark. I am excited about your visit and have been looking forward to it for many months. Please send my regards to Willem, James, Anton and your mom and dad. (1) Woody’s Consumer Brands (Pty) Ltd started construction at 7 Assegaai Road, Kraaifontein in October 2012. They converted two large carcass chillers in a 30 year old factory into a bacon factory. Kraaifontein to the North of Cape Town, just outside Paarl. (2) A Danish spice trader did in fact suggest to Oscar and Eben that they visit Denmark to gain experience in bacon processing. He introduced them to Andreas. This meeting took place in the winter of 2011. (5) Jeppe has been responsible for bacon at the Danish company, Tulip for many years, based in the United Kingdom. Tulip is owned by Danish Crown. 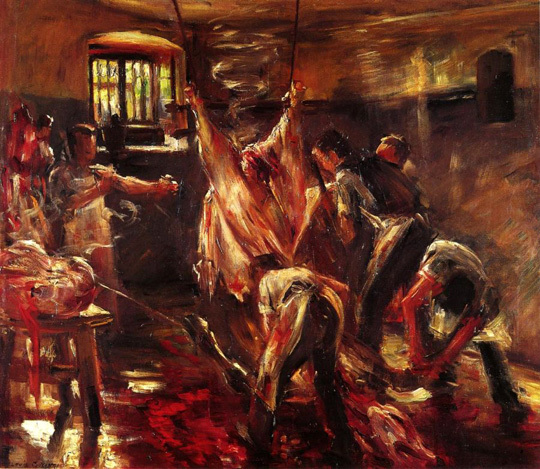 The first Danish cooperative slaughterhouse was set up in Horsens in 1887. This slaughterhouse is now part of Danish Crown. (Danishcrown.com. FAQ. Facts) The cooperative model is still applied to this day in Denmark. The large bacon factories are owned by the farmers. (6) Ammonia refrigeration plants are today one of the most popular, cost effective and safest form of industrial refrigeration. (7) The impact we are discussing here is of course matters that have all been considered post 1920’s, but for the sake of relevance, I include it here. (8) Other factors impacting on the occurrence of purge are the breed of the animal, diet, physiological history, slicing temperature and equipment factors such as the sharpness of the slicing blade. Brown, T, et al. 2003. Practical investigations of two-stage bacon tempering. International Journal of Refrigeration 26 690–697. Daily Telegraph, Launceston, Saturday 2 February 1901. Article: Bacon curing. Daily Telegraph, Launceston, Tuesday 26 April 1910. Article: Bacon curing. Evans, J. 2080. Frozen Food Science and Technology. Blackwell publishing. * James, S. J, and James, C. B. 2002. Meat Refrigeration. Woodhead Publishing Limited. Kennedy C. J. 2000. Managing Frozen Foods. Woodhead Publishing Limited. Smith, Edward. 1873. Foods. Henry S King and Co.